Being in the water treatment business, we get asked a bunch “Why would I want a water system in my house?”. This is a great question and we hope a few of these benefits help you decide if a water system is a good fit for your home. Do you ever see a white “chalky” film on your faucets, shower doors, or refrigerator drip tray? If you do, then you have hard water. Hard water isn’t harmful to your health but can have adverse effects. For instance, hard water mixed with soap creates a soap scum on your skin and causes it to dry out. That is why so many of our customers experience smoother skin and hair once our water softeners have been installed. Taking a shower feels like bathing in lotion. Bottled water is the #1 sold beverage in the United States, according to the BMC “America’s per capita consumption of bottled water has now exceeded 42 gallons” each year. The problem with bottled water is it is expensive, questionable quality, and not to mention environmentally polluting. Having one of our drinking water systems, at your kitchen sink, provides safe and refreshing water to drink, cook, and clean with. The Kinetico® filters last 500 gallons until they need to be changes = close to 4,000 water bottles saved. Every water utility in the United States adds chlorine to their municipal water. We always tell people it is a great thing they add chlorine to the water. If we saw the inside of the water pipes that our tap water travels through,we would never drink it. Plus chlorine kills harmful bacteria like E.coli & cholera, so that saves a ton of lives. However, once the chlorine has gotten to your house it’s best to remove it. Imagine chlorine as the plastic around a loaf of bread. The plastic protects the bread while it travels, but once it gets to your house you take it out of the plastic. Chlorine is designed to kill bacteria: good or bad. Your healthy skin and stomach bacteria fall victim to chlorine’s effectiveness, when you could be bathing and drinking chlorine-free water. Having hard water in your home also decreases the life of your favorite clothes. Imagine the hardness in the water acting like a microscopic sand paper in your washing machine and etching away at your navy and black clothing. Have you ever had a shirt that you wash a few times, and then it gets dingy? Most people think it’s there detergent or washing machine, however it is more commonly the water those clothes are being washed in. 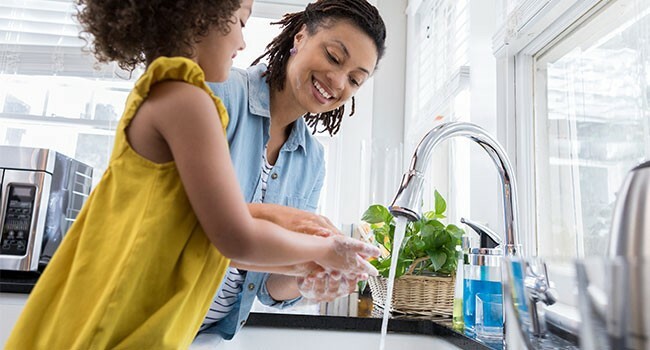 The number one ingredient to most soaps is chemical water softeners, because 85% of American’s have hard water. Therefore, if they did not add them most people couldn’t get a nice head of suds. Once you make your water soft, soap suds right up, and you can use 50-75% less soap in the shower, dishwasher, washing machine, etc.